Family Brassicaceae Burnett, genus Raphanus L.
2n=18. Annual plant. Taproot in the first year forms root crop with rosette with 5-6 big lyre-shaped or pinnate-incisioned, often pubescence leaves, height till 20 cm. Shape of root from flat-spherical till lengthened-cylindrical, mass 10-60 g, colour of rind red, white, pink, pinkish-red, yellow, violet. Stem roundish, pubescence or denudate. Flowers four-termed with white, pinkish or violet corolla. Inflorescence - raceme. Fruit - pod 2.5-7.5 cm length, inflated, glabrate, with beak, fungous inside, with 2-13 seeds. Seeds light-brown, glabrate, spherical, big. Weight of 1000 seeds 7-13.8 g.
Sorts differ by shape of root crops, colour, taste (pungency and not). Most distributed sorts: Zhara, Krasnyi velikan, Rozovo-krasnyi s belym konchikom, Rubin, Teplichnyi, Zaria. Wild kind was not found. Cultivated more than 5 thousand years. There are several centers of introduction in culture: Southern-Western-Asian, Eastern-Asian, Mediterranean, South-Asian, Tropical. Cultivated in Europe since the 16th century. Root crops are cultivated everywhere in the former USSR, but mainly in Nechernozem zone of Russia; plantations for seeds are in Central-Chernozem zone. Mesophyte. Not exacting to heat, bearing short-term frosts. Optimal temperature of growth 15-20°C. Prefers well draining, light, fertile soil with pH 5.5-7.4 and good water supply. Most of sorts are plants of long day (16-18 hours). During short light day (10-12 hours) root crops are formed big and low quality. There is necessary about 500°C of active temperatures for root crop formation, and more than 1800°C for seeds ripening. In optimal conditions shoots appear after 4-5 days after sowing, root crops are ready after 20-30 days for early sorts, and after 40-50 days for late sorts; reproductive period 110-125 days. Cross-pollinated plant. The very early-ripening vegetable. Root crops contains 5-10% dry matter, 0.8-4.0 % sugars, 08-1.3 % proteins, amino acids, vitamins C, B1, carotin, essential oils, glycosides giving pungency. Fresh roots used in food. Used in folk medicine. Average productivity of root crops 8-25 ton per hectare. Cultural flora. Vol 18. Root crops plants. Ed. by V.T. Krasochkin, V.I. Burenin. Leningrad: Agropromizdat, 1985. 324 p.
Grinberg E.G., Romantsove A.A., Mash.janova G.K. Beetroot, carrot, garden radish. Novosibirsk. Zapadno-Sibirskoe book publisher, 1977. 80 p.
Matveev V.P., Rubtsov M.I. Vegetable growing. Moscow: Agropromizdat, 1985. 432 p.
Nikonova N.A. Garden radish. Moscow: Sel.hozgiz, 1961. 72 p.
Recommendations. Technology of garden radish cultivation. Compilers N.F. Ermakov, V.I. Kortukova. Moscow: Rossel.hozizdat, 1987. 30 p.
Sazonova L.V., Pivovarova N.S., Mantarova E.G. 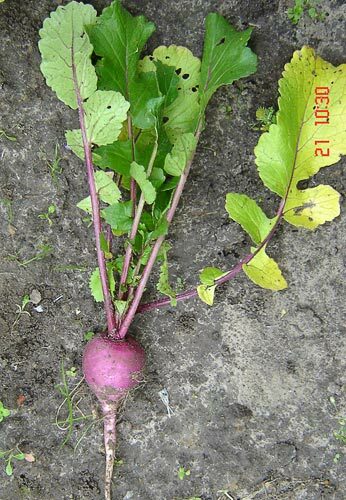 Garden radish, radish, turnip, swede. Leningrad: Agropromizdat, 1986. 56 p.
Vehov V.N., Gubanov I.A., Lebedeva G.F. Cultural plants of the USSR. Moscow: Mysl', 1978. 336 p.
Zhukovskii P.M. Cultural Plants and their Relatives. Leningrad: Kolos, 1971. 751 p.